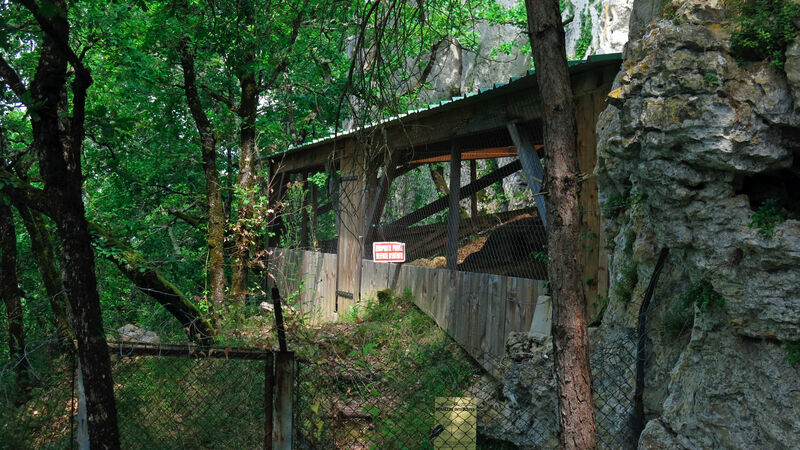 Panoramic view from the cliff line above Roc de Marsal, showing the superb view that the occupants had from their residence, which would have been of great use in planning and organising hunts of the animals which passed along the valley in front of the cave. This three year old child discovered in 1961 at Roc de Marsal (excavations by Lafille) enjoys an exceptional state of preservation. 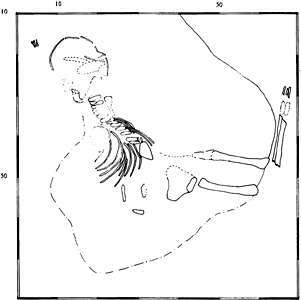 The body seems to have been deposited in a natural depression in the ground, and has been apparently forced into the form of an arc of a circle, lying on its stomach, with a hand to its head and legs bent at 90°, and then immediately covered with soil. 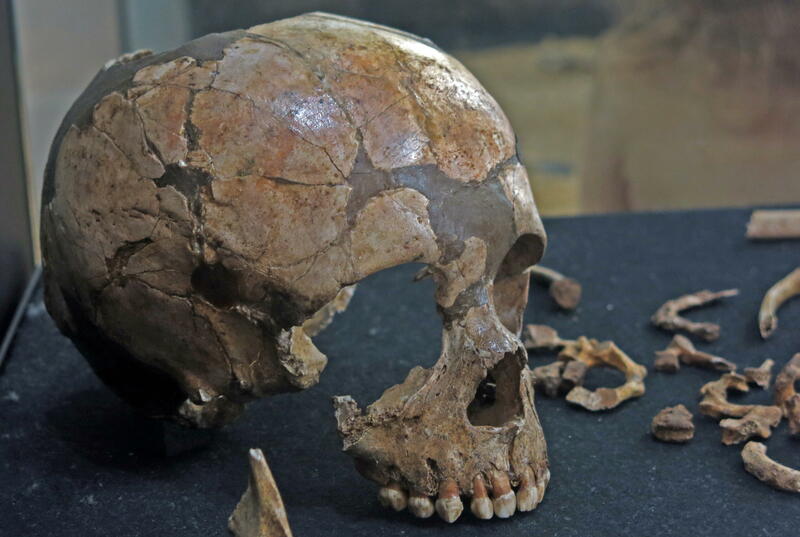 Recent excavations suggest a date of around 70 000 years BP which makes Roc de Marsal one of the oldest burials of the Perigord. Cet enfant de trois ans découvert en 1961 au Roc de Marsal (fouille Lafille) jouit d'un état de conservation exceptionnel. Le corps semble avoir été déposé dans une dépression naturelle du sol, et quelque peu contraint pour epouser une forme schématique en arc de cercle: couché sur le ventre, une main ramenée à hauteur de tête et jambes pliées à 90° l'ensemble recouvert immédiatement de sédimentes. Les fouilles récentes suggèrent une datation aux alentours de 70 000 ans et font du Roc de Marsal une des plus anciennes inhumations du Périgord. 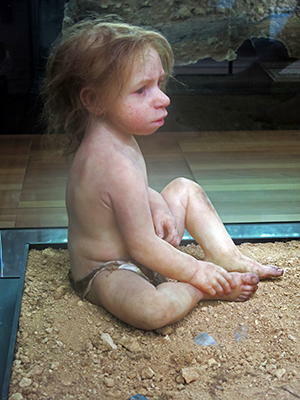 Neandertal models, beautifully crafted. The child is listening to the man attentively. The sculptor was not credited, but it is the work of Élisabeth Daynès. The adult is based on La Ferrassie I. 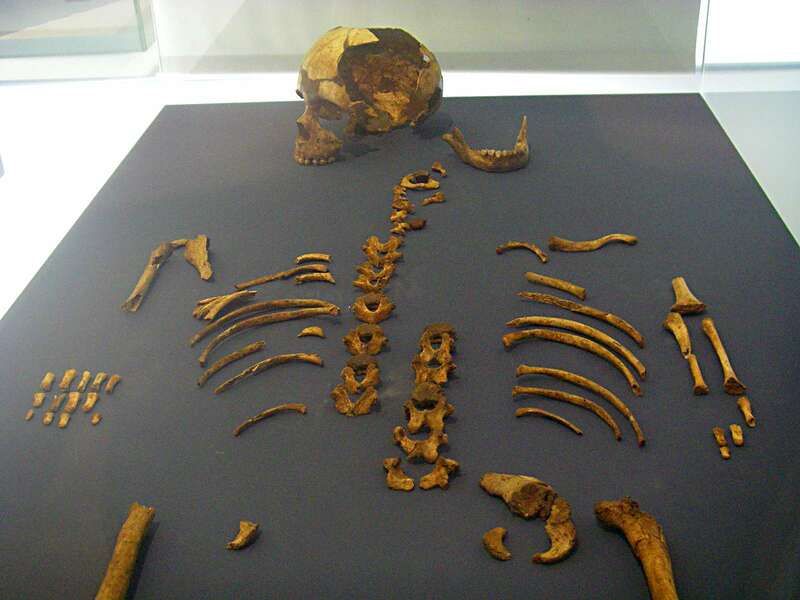 The child is based on the three year old found at Roc de Marsal. It is a superb work, a real tour de force by a master sculptor. This is not just an illustration for a museum, it is a work of art suitable for any display of the best work that humans are capable of. I am in awe of the talents and artistry of Élisabeth Daynès. She is a world treasure. 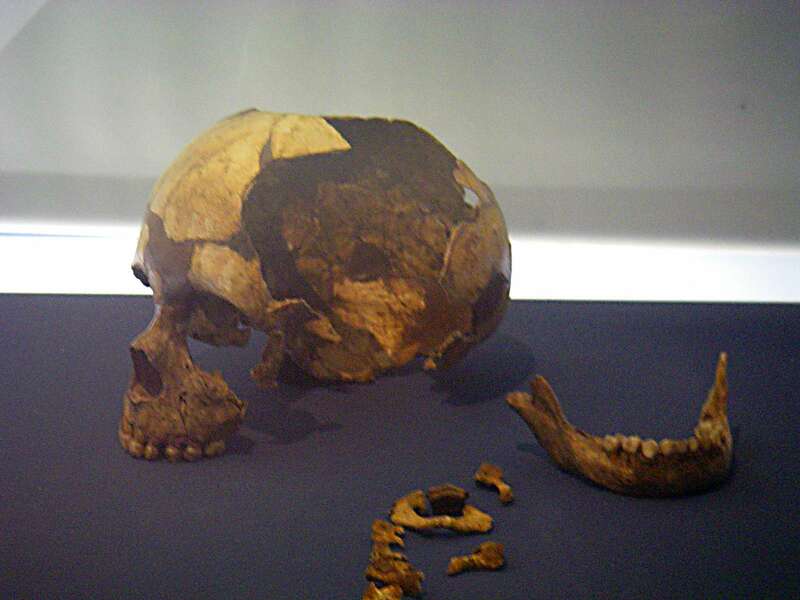 Skull and mandible of the infant, with the sculpture of the infant and adult behind. 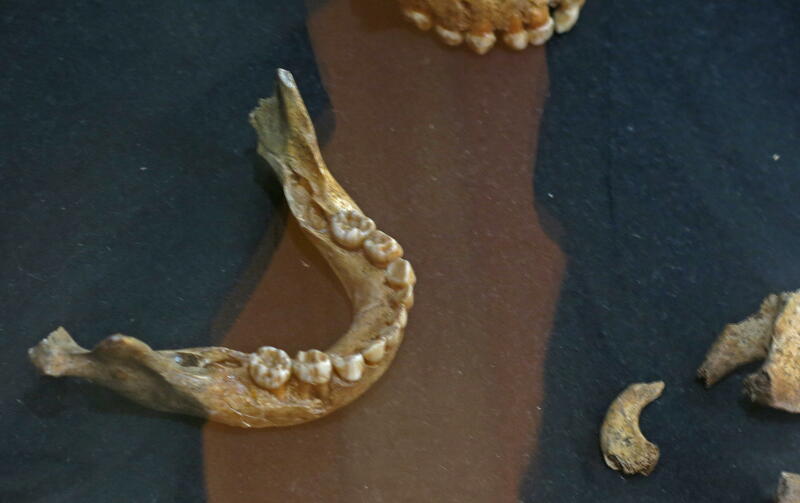 Mandible of the infant from above. 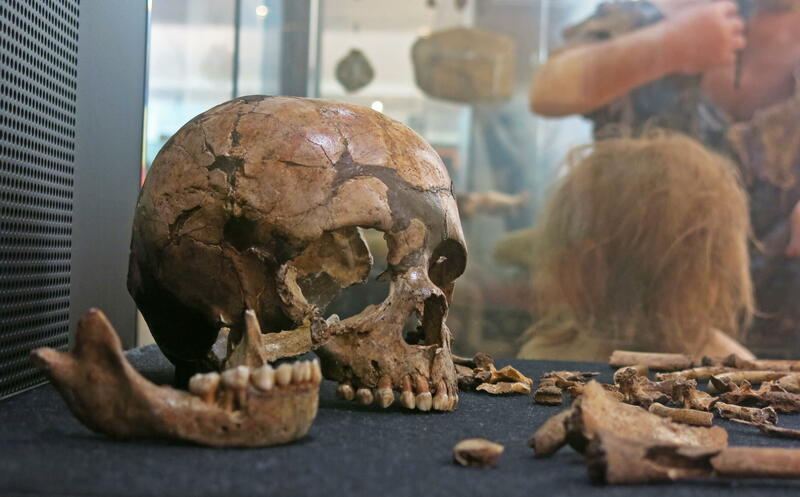 The 70 000 year old remains are in remarkably good condition. The vertebrae have been overlapped in order to fit the skeleton in the available display case. 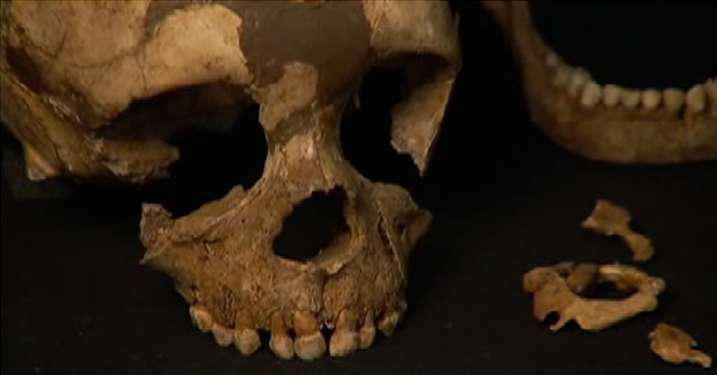 It is also very fortunate that we have both the skull and the mandible. 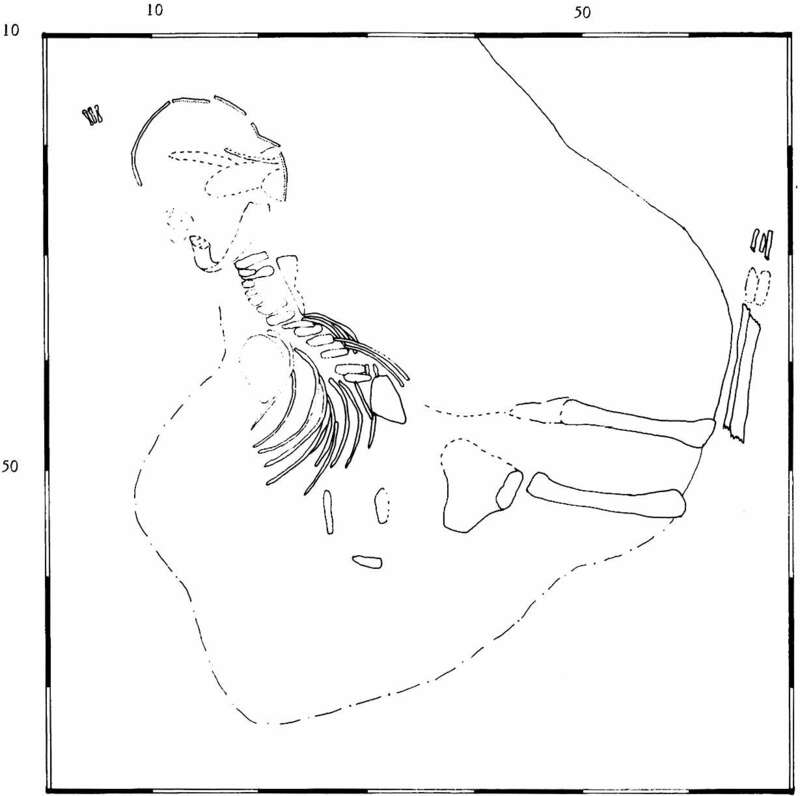 Representation of the original disposition of the bones of the child burial. These photographs were made with available light, which was relatively dim in the exhibition hall. 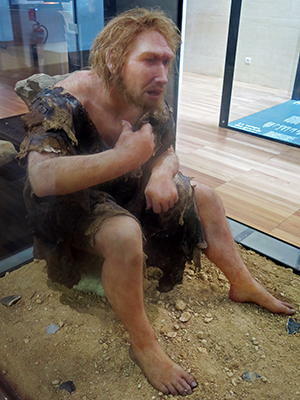 On the first visit, I was expressly permitted by three separate officials to take photographs using flash, and on the second visit, a few days later, flash was prohibited. 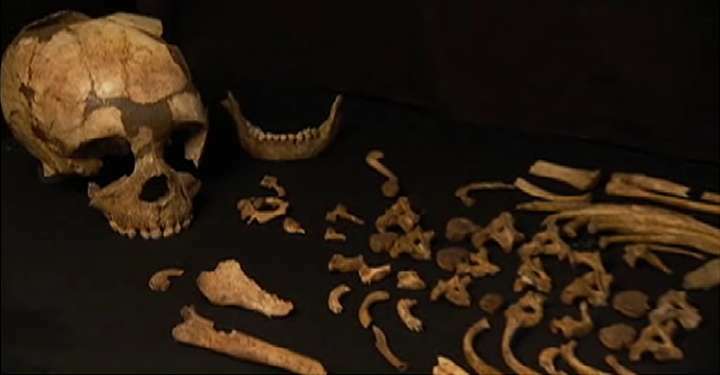 Images of the Roc de Marsal skeleton, from a PBS video with Harold Dibble, who has done a huge amount of work at the Roc de Marsal. 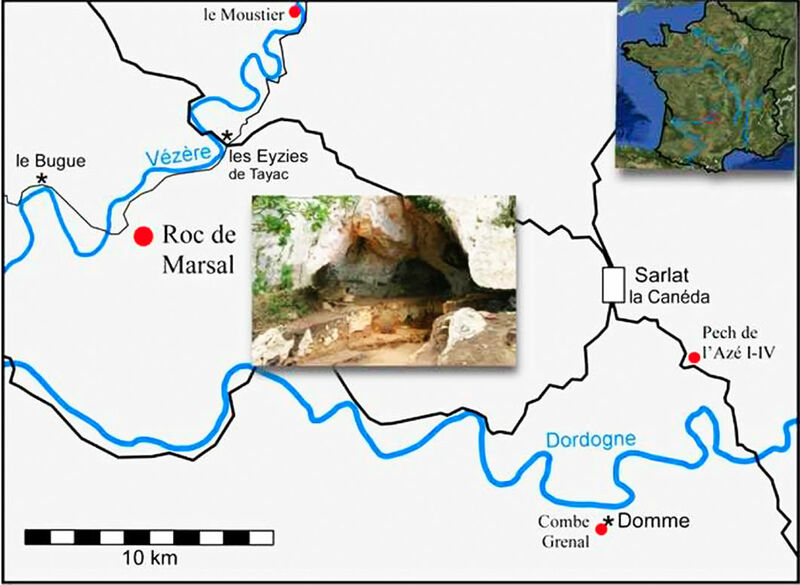 Images of the Roc de Marsal cave dig and the surroundings. 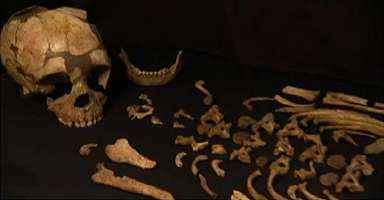 Beginning in 1993 Harold Dibble and other distinguished archeologists have been doing intensive fieldwork on the site, and are now, in 2010, in the process of finishing the analysis of the finds, and preparing for publication. 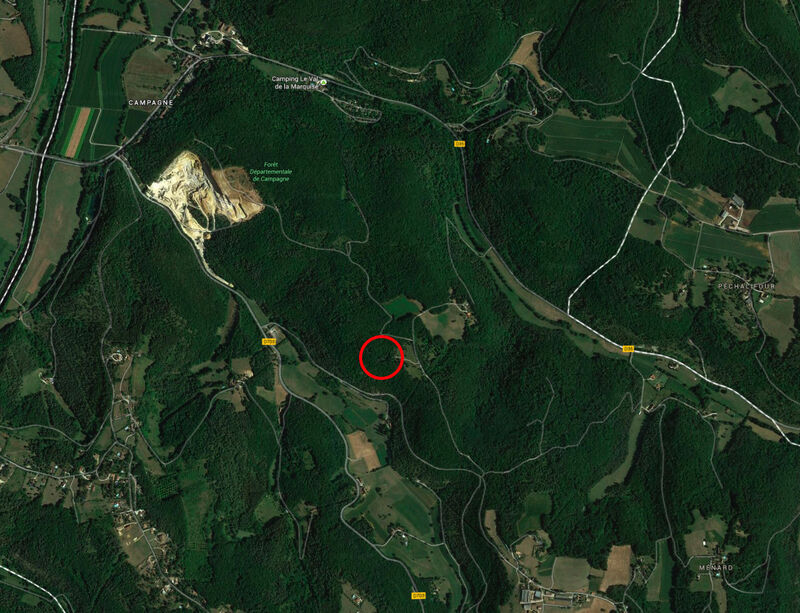 Position of the Roc de Marsal, near the little village of Campagne, between Le Bugue and Les Eyzies. 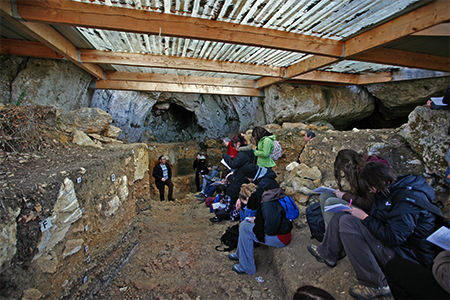 Under the now more extensive roof, with translucent panels to provide more light, showing a study group led by Alain Turq. 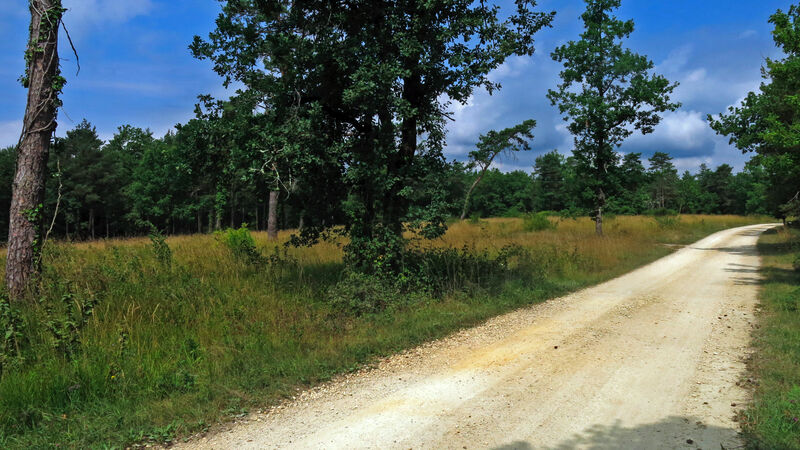 Approaching the site, drive up this side road from D703 after passing the quarry. One of the signs points to 'Les Bernards'. 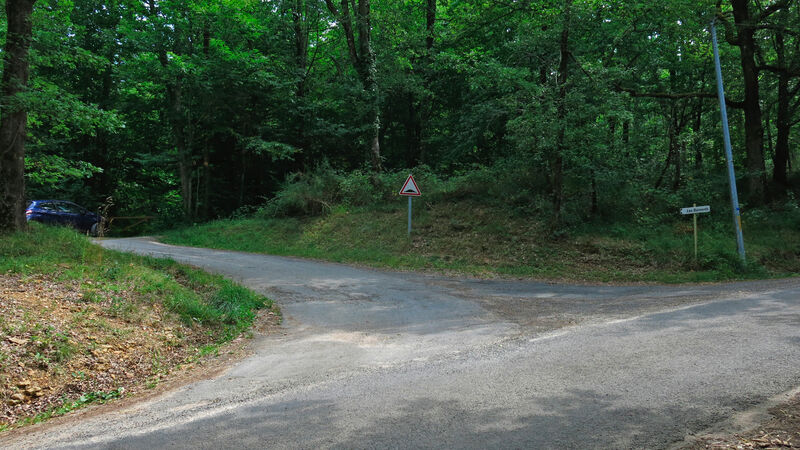 Then turn left at the next sign to 'Les Bernards', and drive to the top of the plateau. 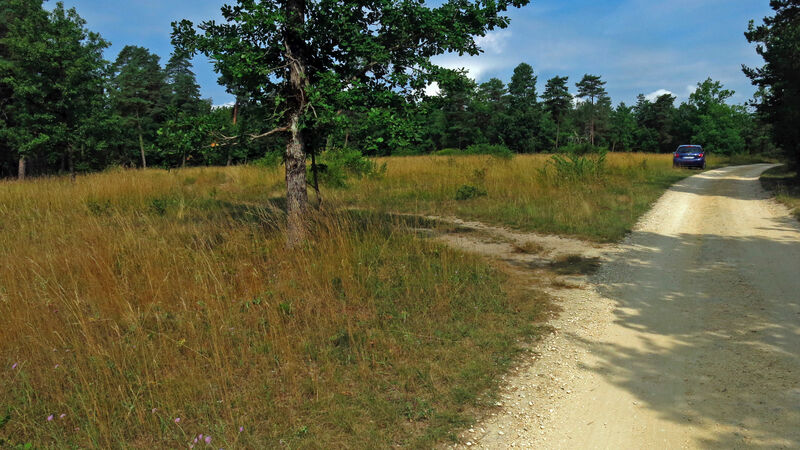 When the road levels out, you will see a dirt track leading off to the left. 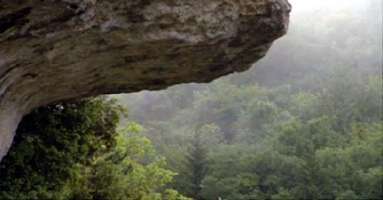 Park the car off the road and walk down the track to the top of the cliff line. 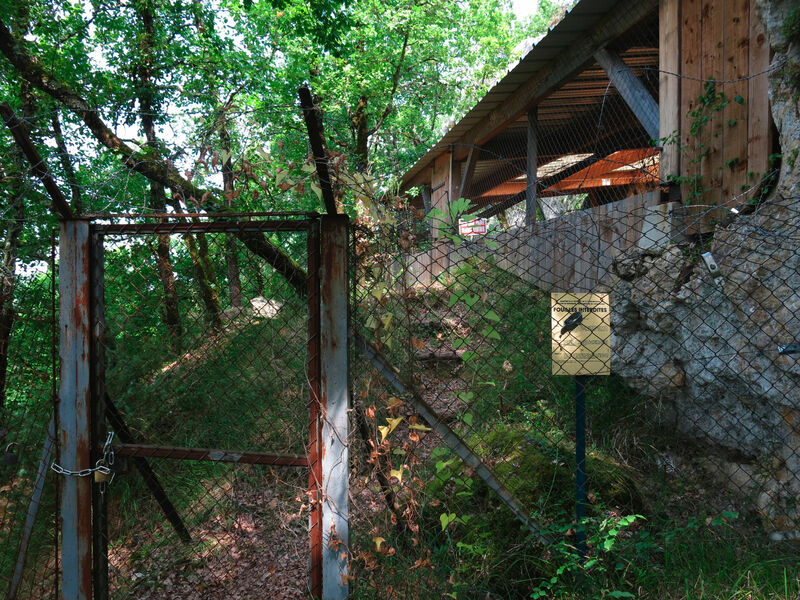 From there you can go down a steep slope to the left, and thus arrive at the (locked) gate of the site. The site is protected by a fence, a roof and walls. 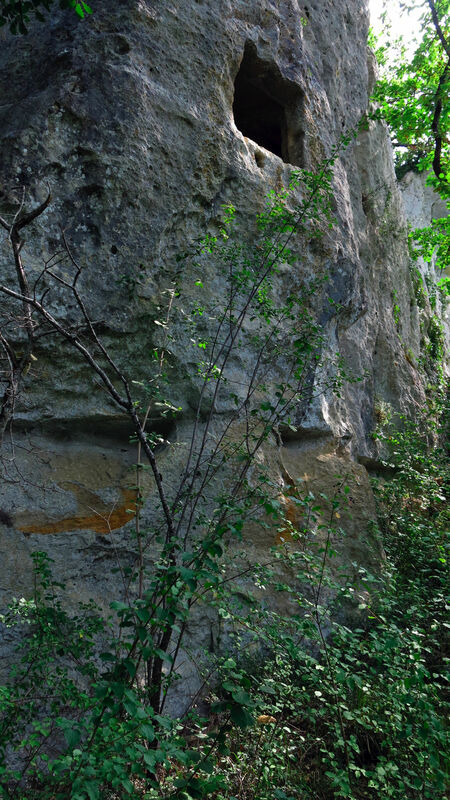 If you come down the cliff from the other side, as you approach the site, evidence of past use becomes evident. This hole in the cliff was cut in order to watch for invaders in the middle ages. 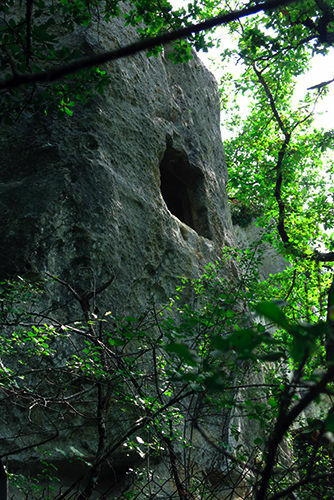 There were many of these in suitable locations in cliffs along the Vézère valley and the smaller valleys leading into it. Most are still visible and not much changed, although the ladders and beams often let into the cliff line to provide access and supports for an observation platform have long since disappeared. And eventually you approach the site once more, from the opposite side. 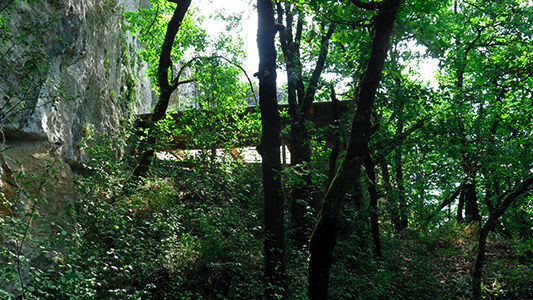 Back on top of the cliff, you can see the top of the protective roof, and the view up the valley which the original inhabitants would have seen, though perhaps with less tall vegetation, given the colder climate. Left , map of the cave with the current excavation grid; the squares originally excavated by Lafille, those of the excavations from 2004 to 2010, and the location of the remains of the Roc de Marsal 1 skeleton. 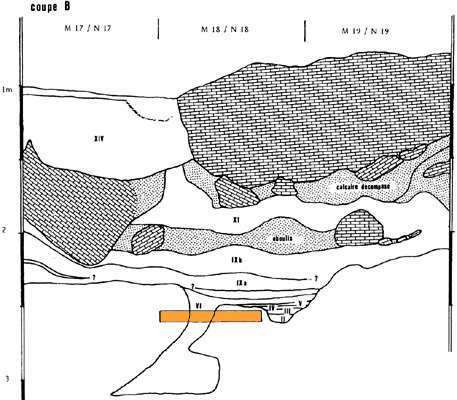 Note some of the fallen bedrock blocks near the trench, which indicate that the roof extended further to the south at the time of occupation, perhaps up to 2 m. The dashed red rectangle shows the location of the map on the right . 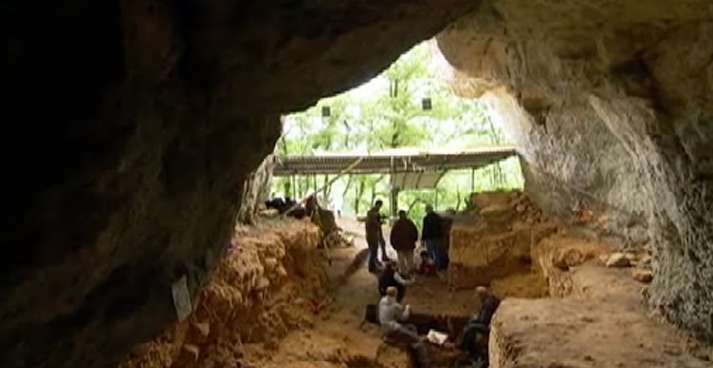 Lithic industry associated with the Roc de Marsal skeleton. Deciding to lay the dead body of the child into the depression in the cave floor. 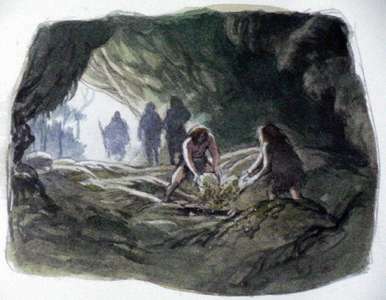 Superb watercolours were done for the Neanderthal exhibition at the Musée National de Préhistoire by the French artist, Emmanuel Roudier. Arranging the body in the depression. Covering the body with soil and rocks carried into the cave using an animal hide. Jean Lafille at the entrance to Roc de Marsal. The cave of Roc de Marsal is on the southwestern slope of a late cretaceous limestone cliff overlooking sixty metres of the Retonde valley. 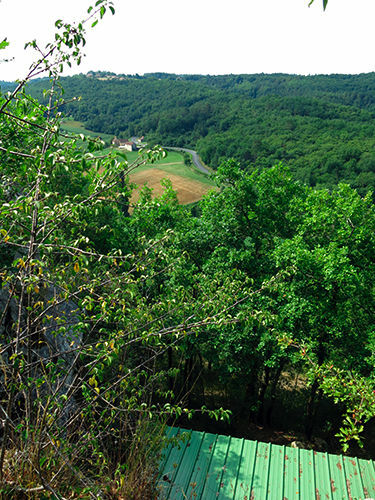 The valley joins the left bank of the Vezere, slightly below the village of Campagne-du-Bugue. In 1953 J. Lafille sunk a trench in this cave, well known since Medieval times. 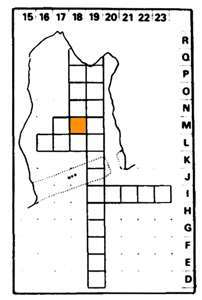 From April to September 1954 he broadened and deepened it, allowing him to number 14 layers from bottom to top. From 1954 to 1971 until his death, he excavated only 27 square meters in area, thoroughly mapped 25% of the objects, took many notes, and made 30 linear metres of trenches. 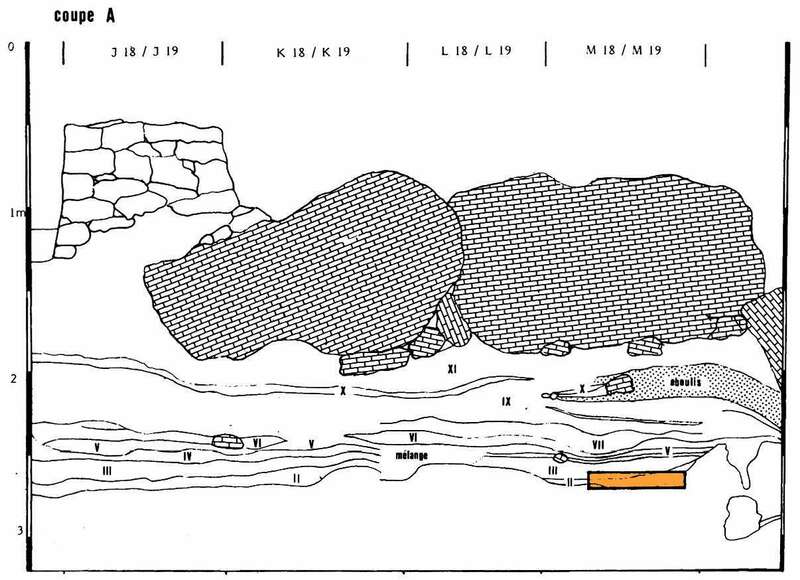 Study of the deposits by Assassi (1986) showed that most of the sequence was deposited during generally cold weather. Only the base (layers A and I) and the top layer (XIII) correspond to warmer, wetter times. 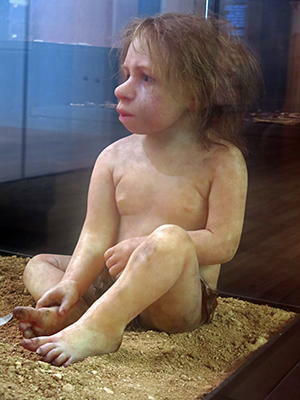 History of the discovery of the Neandertal child. 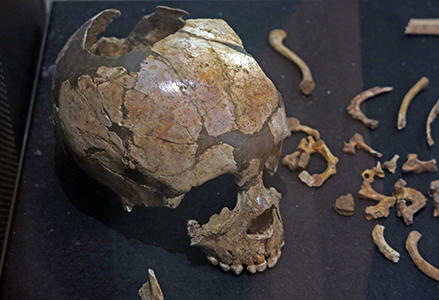 On the 15th August 1961 while removing the yellow layer of decomposed calcareous sandstone underlying layer VI in the M18 quadrant, the excavator found, first, some debris that he interpreted as cranial remains of a child. 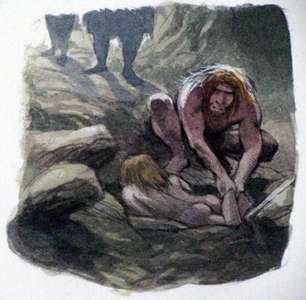 Immediately he decided to dig vertically in M17 to establish a coupe, a vertical face. 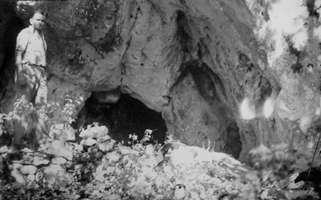 During this operation a few centimetres of the D layer crumbled and emptied a pouch filled with a powdery black earth. The shape of the skull became clearer and he stopped digging. On 16th August Mr Bouchud came on site and noted the discovery of the skull of a child. Professor F. Bordes was notified by telegram. 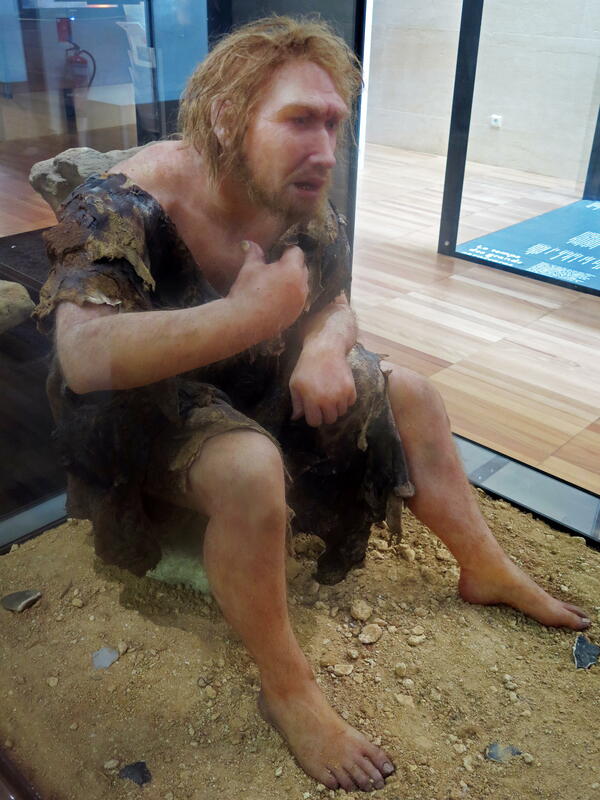 On August 17 he came to the dig to acquaint himself with the discovery. Mr Bouchereau took the first photographs. 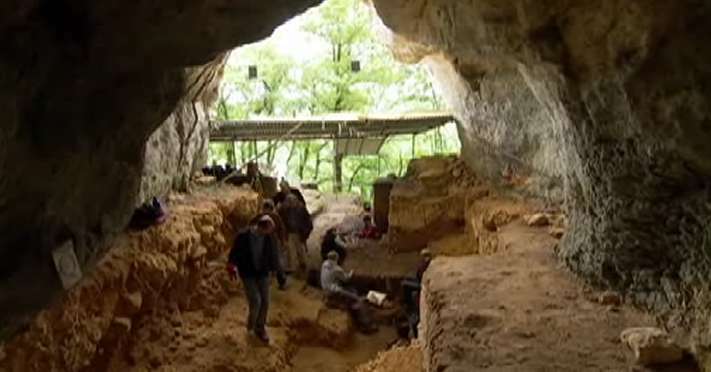 On 18th August Professor H. L. Movius (who was responsible for the Abri Pataud dig) who J. Lafille had asked to take part, put at his disposal three excavators, F.D. 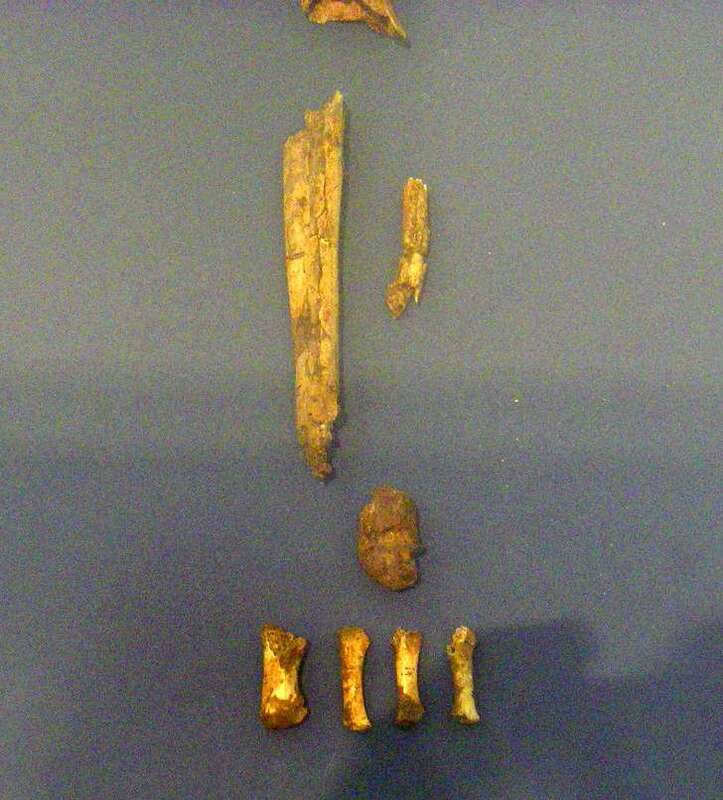 Davis, S. Natoneck, E. Orville and equipment for the excavation of the skeleton. 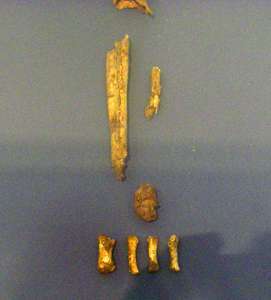 Excavations continued on 21, 23, 25 and 28 August. 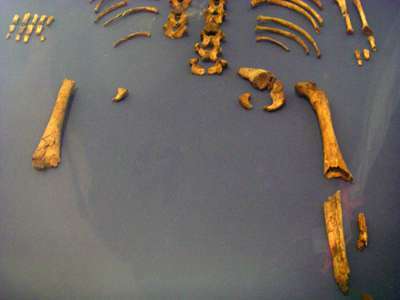 On the 27th, Lafille realised that there was a deterioration of certain bones of the skeleton. 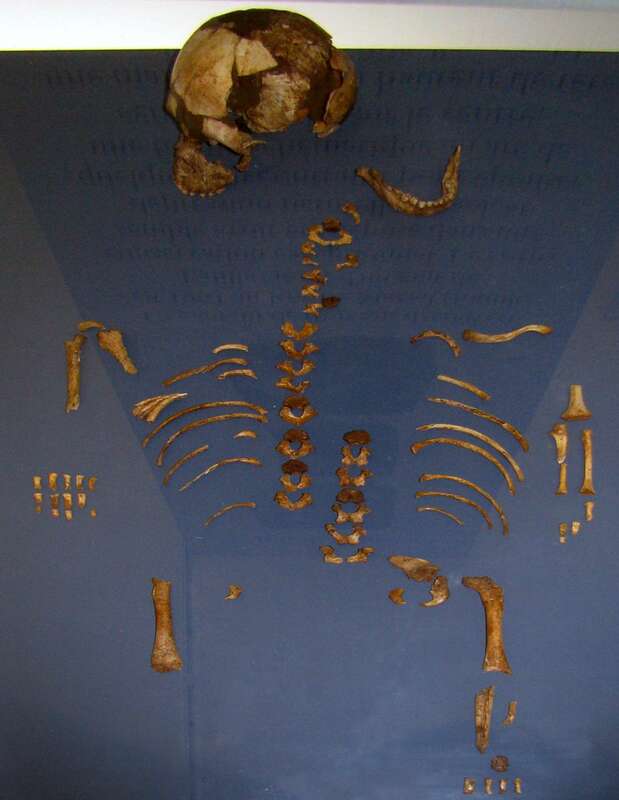 Diagram of the skeleton when found. 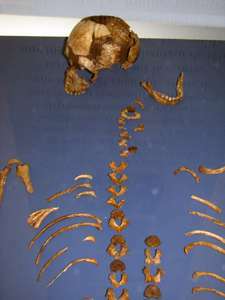 The skeleton was found in quadrant M18. 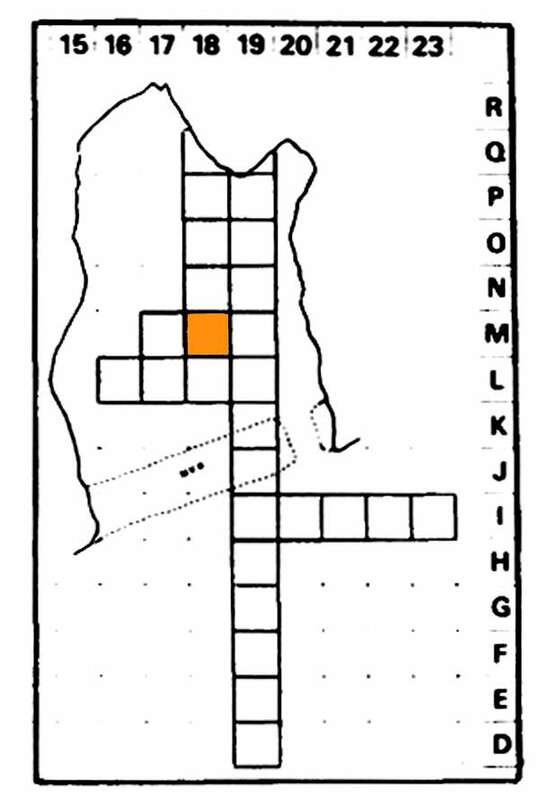 Diagrams of the coupes, or vertical trench faces, showing the position of the child burial, indicated by the rectangle in each case. 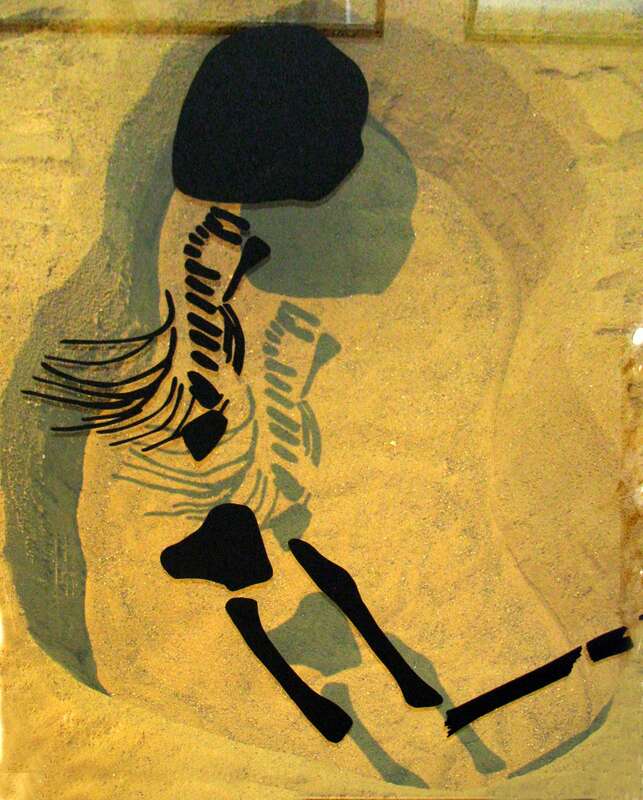 The skeleton, coated in a blackish sediment, was in a pit of 90 x 70 cm, in a hollow in layer I. It was coated with blackish earth, on a yellow layer of decomposed calcareous sandstone which covered the pit, part of the skull was embedded in this layer, and there was an average thickness of 6 or 7 inches toward the center of the pit. 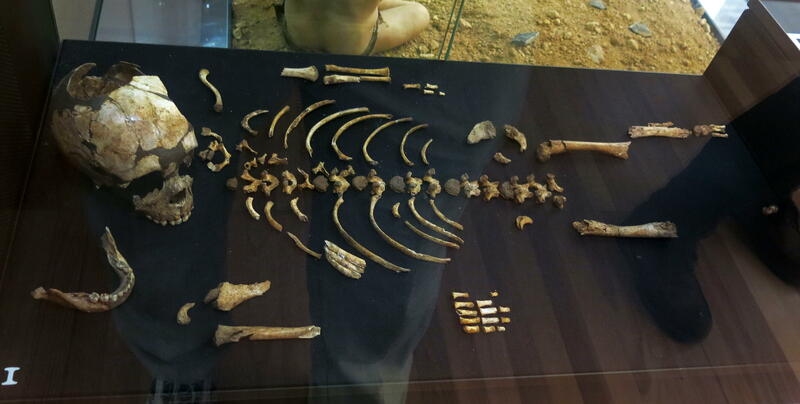 The skeleton is that of a young child apparently aged 2 to 3 years. 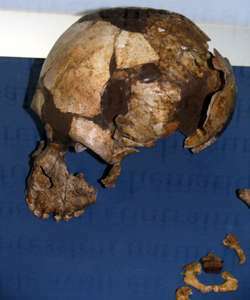 A hand was at the level of the skull, whose face looked down, while the chest is resting on the right side. 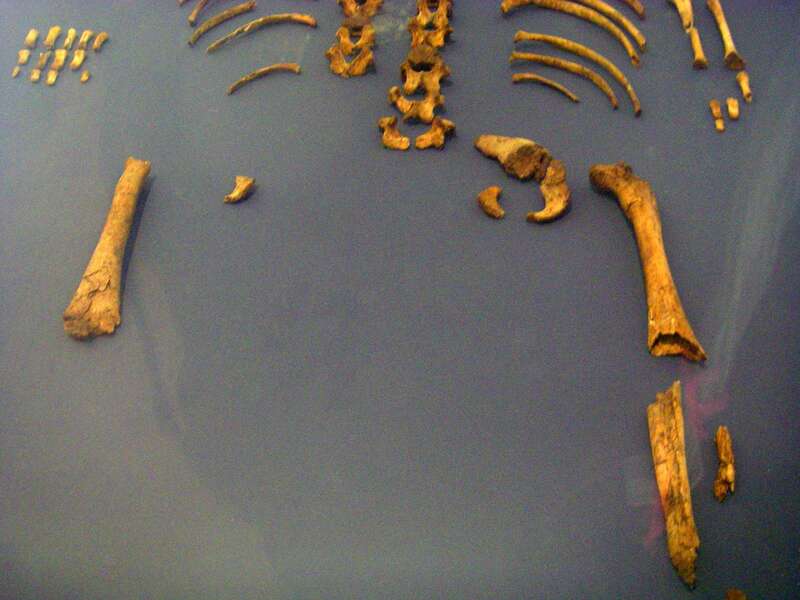 Both femurs are in the same horizontal plane, forming an angle with the spine of 135° bending backward, with the tibia and fibula at right angles, also towards the back with the femurs. Perhaps the pressure of the overlying layers, added to the sloping bottom of the pit, partly explains this strange position. 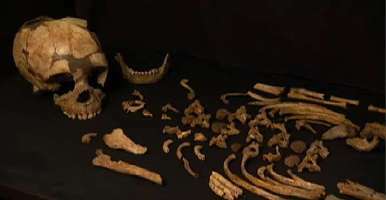 Despite the thoroughness with which the observations were recorded, thorough examination of the data do not provide any particulars concerning funeral practices. No evidence can confirm or deny the intentional nature of the pit. 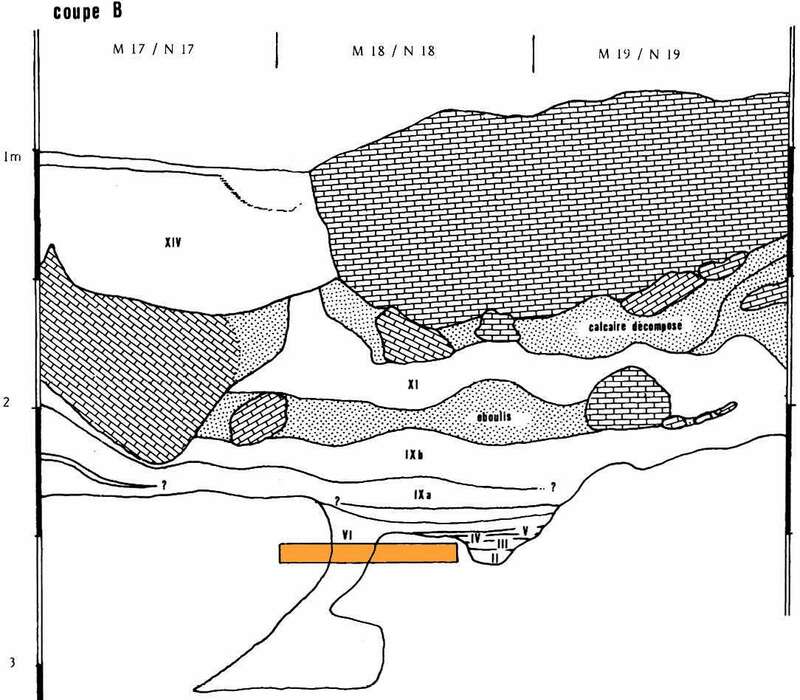 At several points in this deposit have been observed natural depressions, channels, and solution depressions. The sediment surrounding the human remains presents no noticeable difference with the sediment layers of other habitats strongly altered by humans which are often of a blackish powdery nature. As the sediment overlying the skeleton is a decomposed limestone it covers several levels of the stratigraphy. 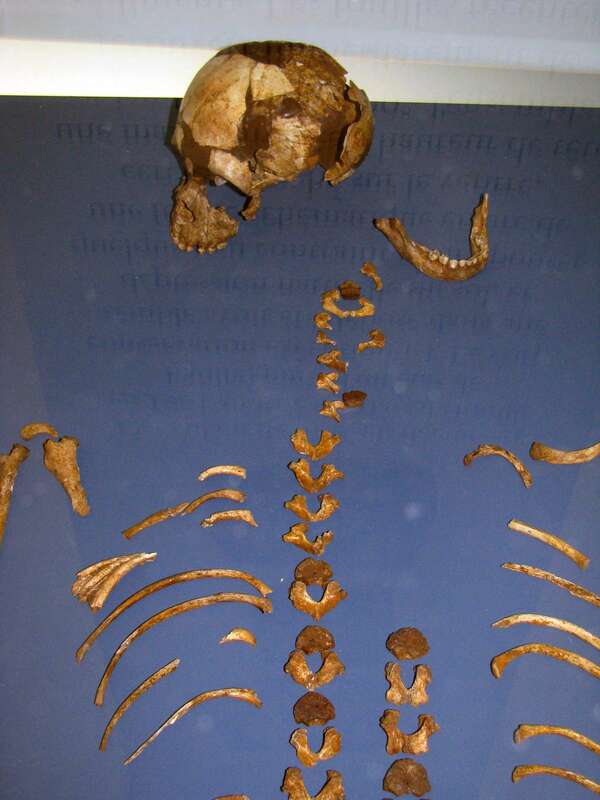 Despite this, it is important to note that almost all the bones are anatomically connected and that their state of preservation is quite exceptional. Alain, T., 1989: Le squelette de l'enfant du Roc-de-Marsal. 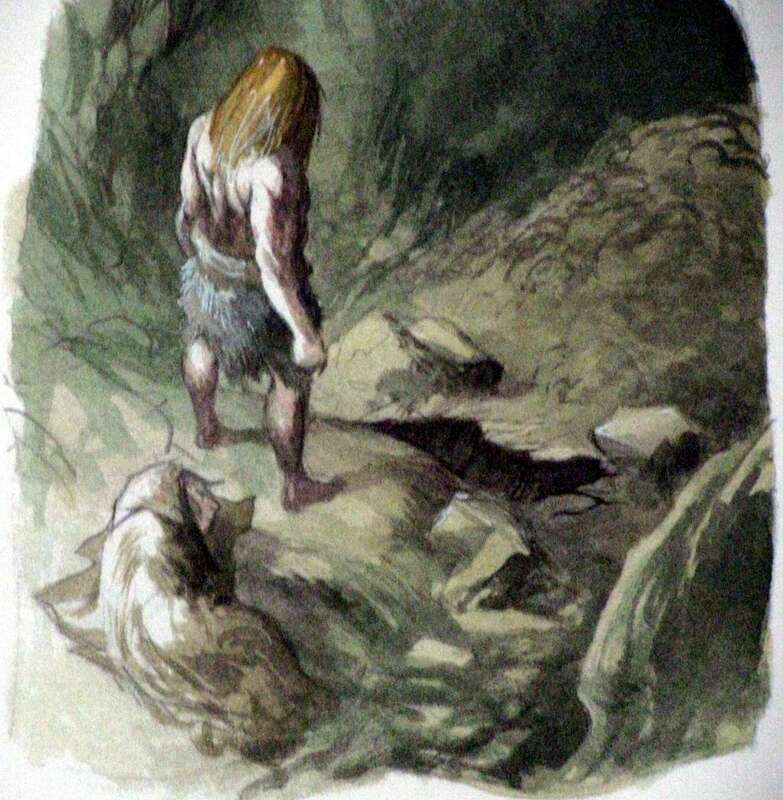 Les données de la fouille. Paléo. No. 1, 1989. pp. 47-54.